This page provides information on the architecture of the second version of the Neo1973 debug board (the one shipped with the "Advanced" Neo 1973 kits). 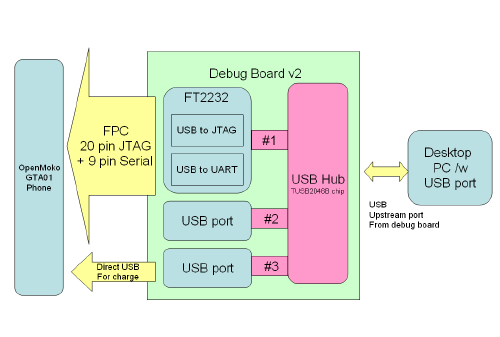 For the USB hub we use the TUSB2046B chip. Using the hub, you can have access to the phone, JTAG and serial simultaneously, through a single USB cable. You can actually even charge the phone (100mA slow charge) using that downstream port. 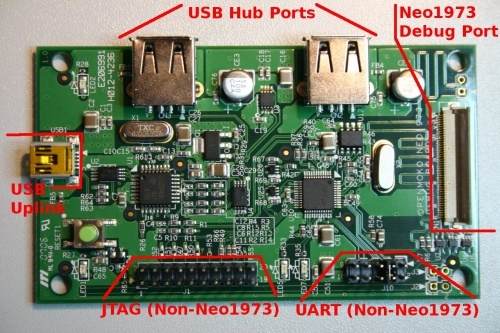 If you have 2 free USB ports on your PC, it is better to plug the debug board and the Neo1973 into the PC independently (rather than using the hub). This will allow the Neo1973 to charge at the full 500mA rate, and will also allow the debug-board USB to be unplugged/reconnected without affecting the Neo1973. The serial port needs a tri-state driver, since it is both connected to the GSM modem AND to the debug board. We drive the tri-state driver by an inverted GSM_EN signal (pin 7 on FPC connector). Please see Neo1973 Debug Board v2/EEPROM if you have an "early adopter" board with USB ID 0403:0610. If your board shows up as USB ID 1457:5118 then you can ignore this step. Please make sure you have libftdi-0.8 or later. Earlier versions are known to cause problems. This should not be an issue if you are using statically-linked binaries. openocd is required. It is recommended to use a statically-linked binary produced by the Openmoko build system. Other versions may give "unrecognized command" errors while parsing the configuration file. dfu-util is used to write images to the NAND flash once you have a functional u-boot. It is recommended to use a statically-linked binary produced by the Openmoko build system. A Neo1973 with a working u-boot should power on when its USB cable is plugged in, but a "bricked" one will not. Note that there will be no visible feedback from the power-button press on a bricked device. The Linux kernel of your host system will create virtual serial devices called /dev/ttyUSBx where 'x' is a sequentially assigned number. If you don't have any other USB serial converters attached to your machine, the device name will be /dev/ttyUSB1 for the serial port. A /dev/ttyUSB0 will also be created initially, but will disappear once openocd connects to the JTAG port. You can use your favourite terminal emulator (screen, minicom, cu, zc, ...) just like for any other/real serial port. The baud rate should be set to 115200. You may use gdb as well (eg. target remote /dev/ttya). The /dev/ttyUSB1 device node will be removed if the debug-board USB cable is unplugged. You should exit your terminal program before unplugging the cable, and then re-run it after the cable is plugged back in. and respawn getty on ttySAC0. if kernel messages on the console are too verbose, use klogd or dmesg (e.g. klogd -c 4). You may now reset the device, set breakpoints, upload images, etc. Refer to Neo1973 Debug Board v2/Unbricking for a manual procedure to re-flash a "bricked" phone (one with a damaged u-boot or environment, where the normal Flashing the Neo 1973 update procedure cannot be used). The following Wiki pages contain useful information about what can be done with the debug board and the u-boot console. Note, however, that some of the information applies to earlier versions of the product and is not suitable for use with purchased GTA01Bv4 phones. We previously had Debug Board v1. Version 1 was never shipped to phase-0 or phase-1, and not sold to anyone. This page was last modified on 10 February 2012, at 08:28. This page has been accessed 144,818 times.